I started with the Nik bundle (which I love), but wondered if I was missing out, and purchased the OnOne bundle too. I find I use Nik much more, specifically Dfine, Viveza, Color Efex, and Sharpener (when it comes time for printing). I have yet to pursue B&W, so haven't used Silver Efex yet. Suprisingly, I bought the bundle for HDR Efex Pro, but don't use it at all. I've found the filters in Color Efex give me the look that I want. I've only used OnOne's Perfect Resize once (it did a great job), and Photo Tools once, for a model photo shoot that I just couldn't get to look right using Nik's Color Efex. 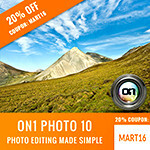 I just purchased the Topaz bundle, after hearing so much about Adjust. Looking forward to trying out their software too! 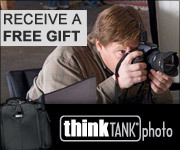 Ron, there's a $125 price difference between the Lightroom and Photoshop versions of the NIK suite. Do I need the photoshop versions for portrait photography? 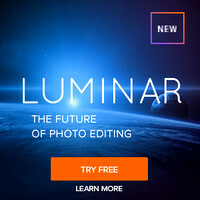 Ron, do I need to spend the extra $125 for the Photoshop version, or is the Lightroom version of the NIK suite just as powerful? Ron, I'm interested in the NIK suite. I the Photoshop version necessary, or worth the extra $125? Yes, I think so because I still find layer masks faster for some things. U-points are great and I use them a lot, but for portraits I prefer to use some effects only on the skin, eyes or clothes individually and usually I have masks for them for other work I do. I am into plug-ins big time too. I really think Topaz Black and White Effects is a fabulous product that creates looks Nik's Silver Efex Pro cannot do. Also the new photoFXlabs v1.1 has a great Dynamics slider that gives that Topaz Adjust look without overdoing it and I am finding it is really great. My favorite plug-in overall is Nik's Viveza 2 - can't live without it! Love your blog too. Any comments on the new onOne Suite 7? I haven't had a chance to look at it yet. I hope to do an update review in mid-December where I can comment on it. I would call myself an above average amateur photographer. My equipment is older. Please don't laugh....I have a very old Minolta Maxxum 5D D-SLR and a Canon PowerShot SD1000 that I use to take photos with. I have LR4 and CS6 (still learning both of them! I was a PS7 girl until very recently) I take pictures of animals, scenery and some people shots. I also have to fix other people's photos for fund-raising projects I do. I tried the trail of Color Efex Pro 4, and was also thinking about trying Viveza 2. I'd sure like your opinion. My review of Color Efex says it all - I'd not be where I am today if it wasn't for that product and I couldn't live without it. Viveza is extremely helpful as well - especially if you aren't a guru at creating masks. I love em and use them both, but I do use Color Efex Pro more than Viveza so if I could only have one it would be Color Efex Pro. Thank you, Ron! I appreciate you taking the time to reply! I appreciate your information, but could not help but notice that it was created in 2012. Lord knows how quickly these programs become outdated. I was hoping to find information partaining to extraction. I currently have Ps CS5 and while I feel it does a great job at extracting, it also takes me a lot of time in order to get the job done to my liking. Would you suggest any given program that does a better job at extracting than Ps does? And by better I mean faster with similar results. I have purchased most of the popular plugins. But the deeper I delve into Lightroom (an amazing piece of software), the more I am seeing that it's really not necessary to use plugins. You can essentially do the same things as these plugins with the tools Adobe has provided. It's simply a matter of knowing how to use the tools. Incidentally, I use Lightroom 4. Correct, and you can use a hand saw and a traditional hammer to build a house. However, a power saw and a nail gun sure make things go by faster, and that's effectively what these tools offer. What's more, many of the things done by these products aren't easy to figure out nor are many of them readily available on the web (sure with enough experimentation and perhaps enough web crawling you might find similar solutions). 1. Time to focus on doing what you want to accomplish rather than mechanics. This is especially true of the Nik U-Point controls which effectively eliminate the need to create complex masks which saves hours in some cases. 2. Variety - lots of options that you can experiment with a single click rather than doing things manually which can be cumbersome. Those who do it in PS directly often have one workflow and stick to it because experimentation is too expensive. Fine review of the best options out there, Ron....I found myself nodding at your comments on each. Over the years I've tried lots of plug ins myself and I concur with your assessment of the best out there today. I don't know why it took so long for me to find your website. I have been looking for a competent photographer-blogger for years and here you are! I am a recent start-up looking for all the latest and greatest true tips by a photographer who isn't paid off for biased articles. YOU ROCK! And I hope we may someday meet so that I can give you a mushy hug. Thank you, and I will definitely spread the word. Ha, ha - thanks! You made my day! My wife would probably be happier if you just shared links to your favorite articles with your friends and social networks (including Pintrest, Digg, Stumble Upon, etc...) and photography forums! Hi Ron, nice blog and articles, I stumbled across it yesterday. Quick question, I've bought phototools 2.6 and PerfectPhoto Suite 7, however I currently mostly use Perfectly Clear by Athentech. Have you tried Wow! Tonal Equalizer? NIK Collection via GOOGLE is now FREE for Windows/Mac!!! However, I fear it may mean the end of life for that product in the near future which would be a crying shame. is there any quality loss when using color efex pro? It depends on how geeky of an answer you want. Almost any alteration of the original pixels has some cost, but there's nothing you should be concerned about. You'll have more quality loss showing your photos on the web than anything the average plug-in will do. Generally the biggest impact is the loss of tonal range and you have control of that by how much you use the effect, but even that can be desirable if the image looks better after editing. At this point, do you still recommend Topaz above all other Nik replacement options? I'm ready to cut the cord with Nik and learn a new system. I need to update this article but if you are on Windows then Topaz is definitely my favorite right now. They are transitioning to a new platform called Topaz Studio that takes some getting used to but it has potential. I still prefer the full blown versions over Studio, but my workflow still is heavily integrated with Photoshop and Lightroom. On the Mac side, Macphun is a good alternative with their products Aurora HDR 2018 and Luminar and a Windows Beta Version is out so it may become relevant on Windows next year.